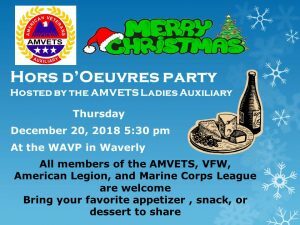 I would like to Thank everyone who came to the WAVP to the AMVETS Ladies Auxiliary Christmas hors d’Oeuvres party on December 20th. Thank You again for supporting the AMVETS Auxiliary. The Winter Department of Iowa State Executive Committee (SEC) meeting will be held Sunday, January 20, 2019 at the Evansdale AMVETS Post (706 Colleen Avenue). The meeting will begin promptly at 9:00 a.m. with a Joint Opening with the AMVETS and Sons. Please let me know if you are interested in attending the Winter SEC meeting. This would be a great opportunity to experience the Department AMVETS Ladies Auxiliary meeting. If you have not paid your 2019 dues to the Auxiliary, they are $25.00. Not much when you realize what your dues do to help our Veterans. With your membership, it gives the Auxiliary strength in numbers when presenting issues to our congress to preserve Veteran’s benefits. Locally it helps with WAVP activities and being able to communicate with our members. We Waited Together, Now Let’s Work TogetherIf you have an email address please send it to Mary Steinbach mjonlyu@outlook.com to receive the calendar and news online. This entry was posted in Ladies Auxiliary Newsletter on January 1, 2019 by msteinbach. As of November 21 The AMVETS Auxiliary had 139 members. 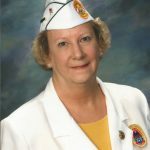 The AMVETS Auxiliary will not be meeting in December. 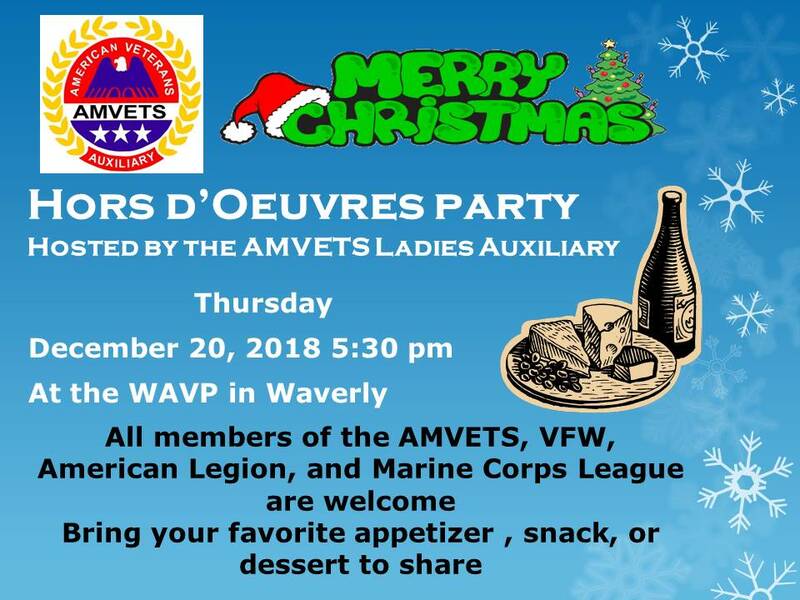 The Auxiliary will be hosting a Christmas hors d’Oeuvres party on December 20th. Everyone is welcome. Please bring an hors d’Oeuvres to share. I would like to wish everyone a Merry Christmas and a Happy Year! May your Christmas be filled with joy and special moments. We would love to have you as an Auxiliary member. Would you consider this? Dues right now are just $20.00 per year but will be going up to $25.00 if paid after January 1st. Not much when you realize what your dues do to help our Veterans. With your membership, it gives the Auxiliary strength in numbers when presenting issues to our congress to preserve Veteran’s benefits. Locally it helps with WAVP activities and being able to communicate with our members. If you have an email address please send it to Mary Steinbach mjonlyu@outlook.com to receive the calendar and news online. This entry was posted in Ladies Auxiliary Newsletter and tagged Ladies Auxiliary, waverly veterans, waverly amvets post 79, waverly area veterans on December 1, 2018 by msteinbach. 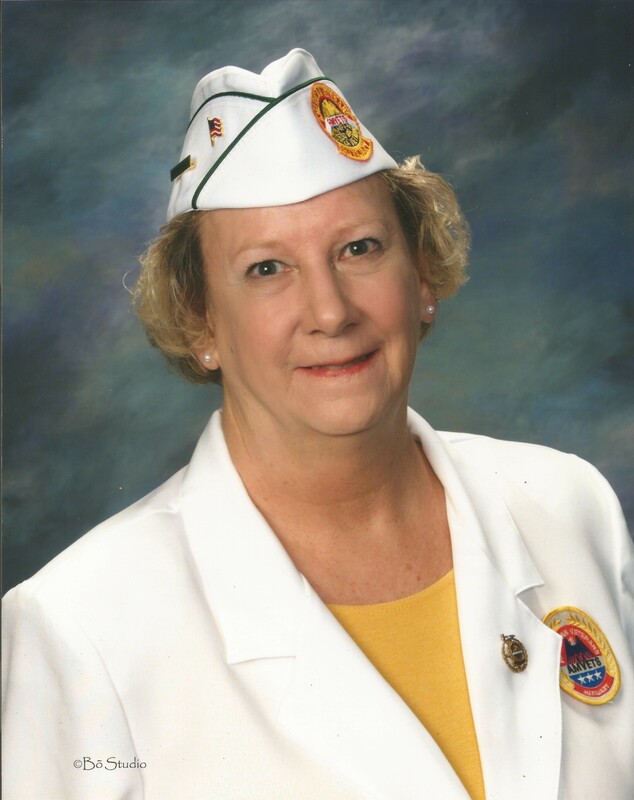 The AMVETS Ladies Auxiliary completes six-month reports on all our programs. These reports are then sent on to the Department of Iowa AMVETS Ladies Auxiliary and then sent on to National AMVETS Ladies Auxiliary. Items that can be reported are – Mileage if driving someone to Doctors appoint for example. Include mileage. Refreshments donated in connection with an activity. Cash donations which benefit an activity which reflects the basic programs of AMVETS Ladies Auxiliary, i.e. Child Welfare, John Tracy Clinic, Day Care Centers, etc. New materials donated. Price of homemade items, gifts and any type of prizes plus time involved. Blood donations, the amount given. Any type of Used Materials donated to Good Will, Trinkets and Togs, etc. Lodging if provided for military service personal, children and adults as a gratis service. Also, we can report Youth Volunteers if the youth is related to an AMVETS or a member of the Auxiliary. Please list their names. Reports can be given to any one of the AMVETS Ladies Auxiliary officers or I am usually home during the day you drop items at my house. 304 7th St SW, Waverly. If I am not at home, leave your report in my mail box. We will have an Auxiliary meeting Wednesday, November 21st even though it is the day before Thanksgiving. Please attend if you are available. This entry was posted in Ladies Auxiliary Newsletter and tagged AMVETS Post 79, Ladies Auxiliary, waverly amvets post 79 on November 1, 2018 by msteinbach. 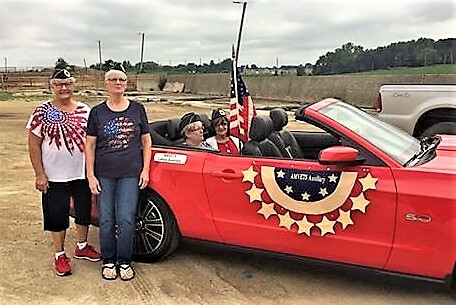 Department of Iowa AMVETS Ladies Auxiliary President Brenda Taylor and First Vice President Carol Finger will be our guests at our Membership Dinner, Oct 10th. If you have attended the funeral of an Auxiliary member please let our Chaplain Nancy Edwards know. Her phone number is 319-573-3451. Also let our Chaplain know if she should send a Symphony card or Thinking of You card to someone you know. This entry was posted in Ladies Auxiliary Newsletter and tagged AMVETS Post 79, Ladies Auxiliary, Iowa AMVETS Post 79 on October 1, 2018 by msteinbach. National AMVETS Convention was August 6 – 11 in Orlando, FL. Mary Steinbach and I attended. We had speakers from Freedom’s Foundation, St Jude’s Children’s Hospital and Paws With A Cause. Very informative convention. I want to thank everyone who comes down to the WAVP and supports the AMVETS Ladies Auxiliary Thursday food nights. 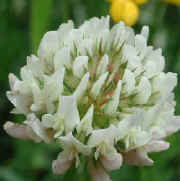 With the money we raise we are able to give donations to National, State, and local projects. We also can give out scholarships to local students. This entry was posted in Ladies Auxiliary Newsletter and tagged AMVETS, Auxiliary, Ladies Auxiliary, Iowa AMVETS Post 79, waverly area veterans on September 1, 2018 by msteinbach. I would like to thanks the AMVETS Auxiliary Ladies who participated in the Heritage Days parade. It is always good to see the AMVETS Auxiliary recognized in the Community. National AMVETS Convention is June 6 – 11 in Orlando, FL. Mary Steinbach and I will be attending from Waverly. I encourage everyone to join us at our Auxiliary meeting in August. Mary and I will share our experience attending the National Convention and all that we have learned. This entry was posted in Ladies Auxiliary Newsletter and tagged post 79, AMVETS Post 79, Ladies Auxiliary, waverly veterans, waverly amvets post 79 on August 1, 2018 by msteinbach. The Department of Iowa AMVETS Convention was held June 8, 9, 10 In Marshalltown. Brenda Taylor from Central City was elected President. I was elected 2nd Vice President, Child Welfare. My project this year will be the Lutheran Services in Iowa the Bremwood campus. Mary Steinbach was elected 3rd Vice President, Community Service. Mary’s project this year will be the Ronald McDonald House in Iowa City. Mary was also appointed Hospital Chairman. Amy Slaba was appointed recording secretary. Jan Lanske will continue as the Hospital Representative for the Veterans Home in Marshalltown. Waverly AMVETS Ladies Auxiliary won the Hazel Vondracek American award and the Depart Hospital Chairman’s award. Marj Reinhardt won the Past Department President’ award for signing up five or more new Auxiliary members. Wanda Benning won the Hospital Memorial award. Emily Archibald, Valparaiso University, Indiana; Biochemistry major; will be a freshman; had to work on our meeting night; from Waverly. Maria Kuiper, second year scholarship, will be a sophomore at U of I, Journalism and Social Justice major, from Waverly. Samantha Edwards. University of Wisconsin -Platteville, will be a freshman, Software Engineering major; from Mt Vernon, IA. I would like to Thank all the Auxiliary Ladies who gave their time and donated food for our monthly food nights. With all that you do we were able to give these scholarships. The Auxiliary will be participating in the Heritage Days, July 21st. Meet at the sales barn at 10:00. Walkers should plan to wear Patriotic Shirts. This entry was posted in Ladies Auxiliary Newsletter and tagged AMVETS Post 79, Ladies Auxiliary, Iowa AMVETS Post 79, Waverly Iowa, waverly amvets post 79 on July 1, 2018 by msteinbach.